An organizational culture consists of the certain behavior patters that exist in any company. Bad performance measurement practices demotivate a team and induce unproductive behaviors, while better behavior patterns help to involve the team and significantly improve the execution process. How to implement it in an organization. One doesn’t exist without another, so if you have decided to improve your culture, make sure you are working in both directions. Let’s start with the discussion of what a good performance measurement culture might be. A typical “bad practice” is when managers come up with certain metrics and are trying to use them to control their employees. This approach is a technical implementation of a “carrot & stick” management style, which obviously has a very limited usage. How to achieve acceptance of the KPIs? How to make my employees accountable? My answer is that it is not possible in the long-term, unless you shift away from the “carrot & stick” approach. 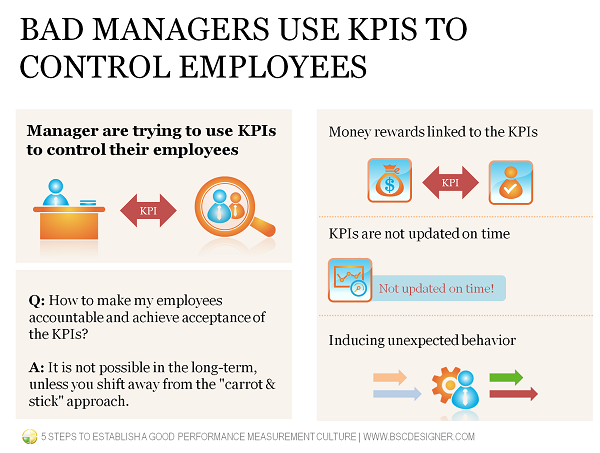 A different situation: employees are not mandated KPIs top to bottom, but do find their proper indicators themselves. In this case the focus is different. Indicators are not for the “reporting & control,” instead employees use them to understand better what they are doing, and how this is helping their organization. In this case the indicators are really owned by the employees: they have suggested them, and they will fight for them. They will go the extra mile to make sure that the indicator is updated on time, and it actually reflects what’s going on in the business. How to make a shift? If on the next meeting you will tell you team that now they are obligated to define KPIs for their projects themselves, don’t expect for anything good to happen. This would be just another form of the “carrot-and-stick” approach. How to do it then? What are you going to do to execute this plan and achieve this goal? How will it help our organization? How will you know that you achieved expected results? How can you quantify this? How can measuring the process/results help us in this case? Make sure that the mentioned Socratic dialog was not a one-time event in your organization. It should be done regularly, as it’s hard to come up with good indicators after the first attempt. What does the new value of the indicator tell us? What can we change: a goal, a plan, execute differently, or should we find a better indicator? One of the exercises that you can regularly practice with your team is trying to understand how the obtained results can be quantified. How can we validate the achieved results? And it’s not about measurement only, it’s about better understanding of the goal and action plan, and finding better ways to execute it. It feels like a good example is needed here. Imagine that I’m doing a training on “Good KPIs / Bad KPIs,” I explained the material, and my students have passed the final test by answering predefined questions. Sounds good? Not exactly! In this case my approach to measuring things is very superficial. I do have some quantified results, but I can hardly say that these results can justify a company’s investments in the training. A better approach is to be proactive, and start preparing the measurement part beforehand. Level 1. Reaction. Did my students like the training (emotionally)? Level 2. Learning. Did they achieved learning objectives that I set? Level 3. Behavior. Did their behavior change after the training? Level 4. Results. Did their takeaways influence an organization? My estimation of training effectiveness can be linked to the number of KPI-related insights that students generated during the training. Instead of controlling the knowledge obtained by the test, I could directly check out how the new knowledge is applied. What about Level 4? Can we measure the performance change in the organization? I think we can! I can ask students to get back to me in 2 weeks and let me know what they have actually implemented in their company. Some additional motivation (like a free eBook) would increase the response rate. 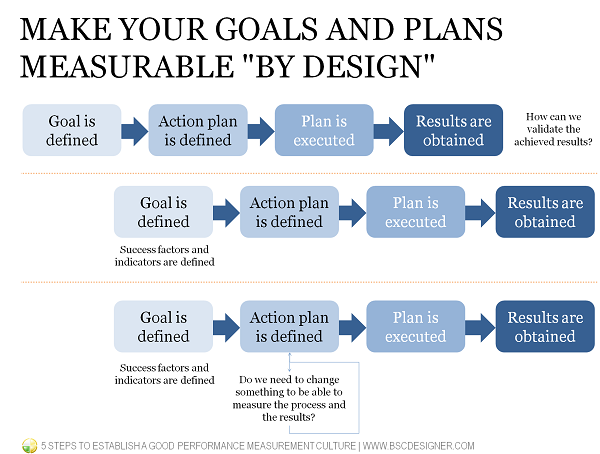 As the example above demonstrates the “measurement” part is not the most important one, it is more about understanding better how expected goals will be achieved and find better ways to execute an action plan. Analyze your current performance measurement culture, find the patterns, understand why they exists, if they are good or bad, and how to replace them. Pay especial attention to how you deal with your measurement system in the hard situations. Do you blame employees for KPIs in the red zone? What you do if it is hard to find good metrics? How did a proper measurement system help your organization in the past? What problems did it help to avoid? Why did you decide to move from Excel, what was achieved? How did bad metrics blind your managers? Document it! Verbal part of the culture is important, but a 1-2-page document where all key principles related to the measurement are explained is also important. The format of manifesto works great (check out agile manifesto as an example). They say that business needs to be transparent and everyone should see the KPIs/strategy of others. For my opinion the main goal of transparency is not to showcase sensitive data, but to lead by example. 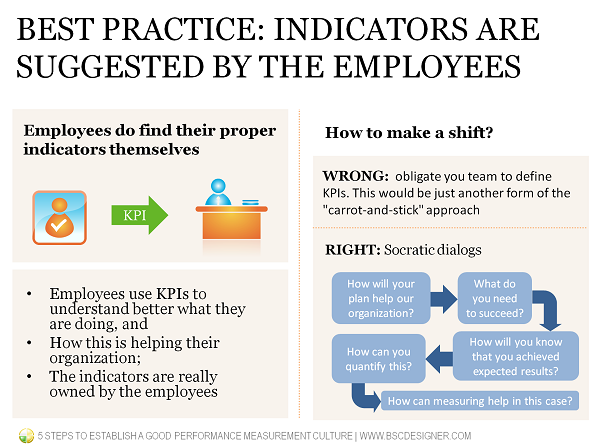 Show what indicators you are personally using, tell your performance story to your team using KPIs. Is it possible to measure the culture? Culture acceptance rate. A simple survey with 2 or 3 options to choose from will do the job. Do it anonymously if needed. Hopefully you won’t stop after obtaining the numbers: go ahead with the discussion about what need to be changed. A device similar to what we have discussed might be used. Turnover rate (among culture carriers). Culture doesn’t exist on the paper, your employees are those who carry and practice it. On the one hand, a high turnover rate might be a sign of losing people that form the organization’s culture, on the other hand, “fresh blood” is a great way to introduce a new culture. Culture is a long run. Be prepared for a 2-years marathon so you can see the actual results that are all over your organization. Your team will need a long time to change their performance measurement habits, but the best time to start is today. Start with analyzing your current situation, and then go ahead with improving your performance measurement patterns step by step. What do you like or don’t like about the performance measurement culture in your organization? Feel free to share your thoughts in the comments.